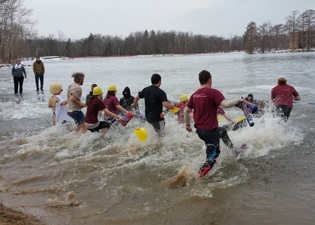 This year's SIU Polar Plunge was a huge success despite the freezing temperatures. With more than 400 participants and 120 volunteers, the university showed its community involvement by way of record numbers of SIU students who participated in the event. Each “plunger” raised a minimum of $75, with the proceeds benefiting Special Olympics Illinois. This year’s event had a twist, too. The SIU Polar Plunge offered the first-ever Polar Donut Dash, a 5K race in which participants could eat a doughnut at each stop along the route to knock a minute off their overall finish times. Working with SIU Housing to distribute flyers in residence halls promoting Polar Plunge. Designing and selling T-shirts at the event, with a significant portion of the proceeds going to Special Olympics. Seeking sponsorship opportunities with local businesses for donations and raffle items. Partnering with McAlister’s Deli to host a fundraising night where AMA members and other Polar Plunge volunteers worked together. In addition, AMA members formed a plunge team that brought in $1,475 and was subsequently recognized as the RSO or Greek organization that raised the most money. Melzer then explained how these proceeds make a difference in the Special Olympics athletes’ lives. As a nonprofit organization, Special Olympics is funded solely by fundraising and contributions. The money raised goes to fund the athletes’ trips to participate in Special Olympics, as well as the events that take place during Special Olympics. Special Olympics athletes attend the SIU Polar Plunge to show their support by volunteering to plunge themselves or by talking with plunge participants. “The overall support of the community is great,” Melzer said. Community members, students, the American Marketing Association, SIU Police, the Recreation Center and University Housing staff are just some of the few groups who help show support for the event. A DJ playing music as well as a master of ceremonies during the plunge. The Illinois Lottery providing a heated tent with hot chocolate and doughnuts. A post-plunge party at the SIU Recreation Center, which included free pizza, raffles and awards for plungers and dashers. For more information on how to become part of the SIU Polar Plunge, visit www.plungeillinois.com.